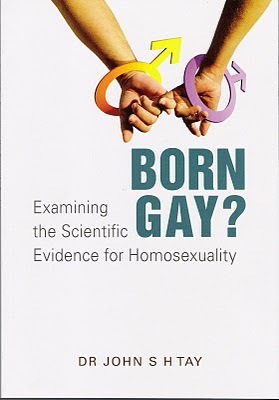 This book is a review of important scientific papers published over the last 20 years concerning the roles of genes and environment on homosexuality. The book examines the statement “I am Born Gay”. The resounding conclusion is that the role of genes is far less important than the role of the environmental factors. No properly qualified geneticist today will ever say or agree with the statement, “I am born Gay, and I cannot change”. Indeed, no form of human behaviour is ever solely inherited. Genes produce proteins, and not behaviour. Behaviour is much more complex than a single protein. For a condition or trait to be inherited, without any influence of the environment, the “heritability” must be 100%, for instance, colour blindness. The heritability of human intelligence is about 75% whereas the heritability of male homosexuality is only 26% (in the key paper based on the Australian Twin Registry, page xxviii in the book, this figure of 26% was not even statistically significant). In other words, environmental factors account for 74% of male homosexuality. Environmental factors are clearly much more important than genetic factors. The scientific community knows these facts for many years, but public opinion is moving in opposite direction, because of the lies perpetuated by the media and the gay activists. When a lie is repeated often enough, many people will believe this lie. The book does not mention anything about God, the Bible or morality. It focuses on the scientific papers and explains the basic concepts. The intention of the book is that key leaders in the nation, especially the politicians, members of the parliament, community leaders, principals, teachers and others, should know the truth and the facts. A key thesis of the book is that if there is a massive disregard of truth in the society, that society will collapse. Examples are given in chapter two. Those who raise the question “What is truth?” are people who have rejected truth. Truth is easily understood and is objective. Clear examples are given in chapter two. Dr John S H Tay studied Medicine in the University of Sydney, Australia, under the Colombo Plan Scholarship (1961- 1966). He graduated with a First Class Honours, Distinction over the whole Medical Course and the University Medal. For his postgraduate studies, he trained as a Paediatrician and graduated with the Master of Medicine (Paediatrics) from the University of Singapore. He is a Fellow of the Royal Australasian College of Physicians, Royal College of Physicians (Edinburgh) and the Academy of Medicine (Singapore). He was an academic staff in the Department of Paediatrics, National University of Singapore for 22 years (1973-1995) and for the last seven years (1988-1995), he was a Professor and the Head of the Department of Paediatrics as well as the Head of the Division of Human Genetics. He holds two doctorates (by theses) in Human Genetics: Doctor of Medicine (thesis: Dermatoglyphics in Paediatrics), and Doctor of Philosophy (thesis: The Genetic Structure of Singapore), both awarded by the National University of Singapore. He has published a few hundred research papers, many of which were in the field of Human Genetics. He is married to Ivy, with two grown–up children and eight grandchildren.